In my previous post, I explored, somewhat jokingly, the grey area between classical physics and quantum mechanics: light as a wave versus light as a particle. I did so by trying to picture a photon as an electromagnetic transient traveling through space, as illustrated below. While actual physicists would probably deride my attempt to think of a photon as an electromagnetic transient traveling through space, the idea illustrates the wave-particle duality quite well, I feel. Understanding light is the key to understanding physics. Light is a wave, as Thomas Young proved to the Royal Society of London in 1803, thereby demolishing Newton’s corpuscular theory. But its constituents, photons, behave like particles. According to modern-day physics, both were right. Just to put things in perspective, the thickness of the note card which Young used to split the light – ordinary sunlight entering his room through a pinhole in a window shutter – was 1/30 of an inch, or approximately 0.85 mm. Hence, in essence, this is a double-slit experiment with the two slits being separated by a distance of almost 1 millimeter. That’s enormous as compared to modern-day engineering tolerance standards: what was thin then, is obviously not considered to be thin now. Scale matters. I’ll come back to this. The table below shows that the ‘particle character’ of electromagnetic radiation becomes apparent when its frequency is a few hundred terahertz, like the sodium light example I used in my previous post: sodium light, as emitted by sodium lamps, has a frequency of 500×1012 oscillations per second and, therefore (the relation between frequency and wavelength is very straightforward: their product is the velocity of the wave, so for light we have the simple λf = c equation), a wavelength of 600 nanometer (600×10–9 meter). However, whether something behaves like a particle or a wave also depends on our measurement scale: 0.85 mm was thin in Young’s time, and so it was a delicate experiment then but now, it’s a standard classroom experiment indeed. The theory of light as a wave would hold until more delicate equipment refuted it. Such equipment came with another sense of scale. It’s good to remind oneself that Einstein’s “discovery of the law of the photoelectric effect”, which explained the photoelectric effect as the result of light energy being carried in discrete quantized packets of energy, now referred to as photons, goes back to 1905 only, and that the experimental apparatus which could measure it was not much older. So waves behave like particles if we look at them close enough. Conversely, particles behave like waves if we look at them close enough. So there is this zone where they are neither, the zone for which we invoke the mathematical formalism of quantum mechanics or, to put it more precisely, the formalism of quantum electrodynamics: that “strange theory of light and Matter”, as Feynman calls it. Let’s have a look at how particles became waves. It should not surprise us that the experimental apparatuses needed to confirm that electrons–or matter in general–can actually behave like a wave is more recent than the 19th century apparatuses which led Einstein to develop his ‘corpuscular’ theory of light (i.e. the theory of light as photons). The engineering tolerances involved are daunting. Let me be precise here. To be sure, the phenomenon of electron diffraction (i.e. electrons going through one slit and producing a diffraction pattern on the other side) had been confirmed experimentally already in 1925, in the famous Davisson-Germer experiment. I am saying because it’s rather famous indeed. First, because electron diffraction was a weird thing to contemplate at the time. Second, because it confirmed the de Broglie hypothesis only two years after Louis de Broglie had advanced it. And, third, because Davisson and Germer had never intended to set it up to detect diffraction: it was pure coincidence. In fact, the observed diffraction pattern was the result of a laboratory accident, and Davisson and Germer weren’t aware of other, conscious, attempts of trying to prove the de Broglie hypothesis. 🙂 […] OK. I am digressing. Sorry. Back to the lesson. The nanotechnology that was needed to confirm Feynman’s 1965 thought experiment on electron interference (i.e. electrons going through two slits and interfering with each other (rather than producing some diffraction pattern as they go through one slit only) – and, equally significant as an experiment result, with themselves as they go through the slit(s) one by one! – was only developed over the past decades. In fact, it was only in 2008 (and again in 2012) that the experiment was carried out exactly the way Feynman describes it in his Lectures. The second inset (in the upper-right corner) shows the mask that can be moved to close one or both slits partially or completely. The mask is 4.5µm wide ×20µm tall. Please do take a few seconds to contemplate the technology behind this feat: a nanometer is a millionth of a millimeter, so that’s a billionth of a meter, and a micrometer is a millionth of a meter. To imagine how small a nanometer is, you should imagine dividing one millimeter in ten, and then one of these tenths in ten again, and again, and once again, again, and again. In fact, you actually cannot imagine that because we live in the world we live in and, hence, our mind is used only to addition (and subtraction) when it comes to comparing sizes and – to a much more limited extent – with multiplication (and division): our brain is, quite simply, not wired to deal with exponentials and, hence, it can’t really ‘imagine’ these incredible (negative) powers. So don’t think you can imagine it really, because one can’t: in our mind, these scales exist only as mathematical constructs. They don’t correspond to anything we can actually make a mental picture of. The electron beam consisted of electrons with an (average) energy of 600 eV. That’s not an awful lot: 8.5 times more than the energy of an electron in orbit in a atom, whose energy would be some 70 eV, so the acceleration before they went through the slits was relatively modest. I’ve calculated the corresponding de Broglie wavelength of these electrons in another post (Re-Visiting the Matter-Wave, April 2014), using the de Broglie equations: f = E/h or λ = p/h. And, of course, you could just google the article on the experiment and read about it, but it’s a good exercise, and actually quite simple: just note that you’ll need to express the energy in joule (not in eV) to get it right. Also note that you need to include the rest mass of the electron in the energy. I’ll let you try it (or else just go to that post of mine). You should find a de Broglie wavelength of 50 picometer for these electrons, so that’s 50×10–12 m. While that wavelength is less than a thousandth of the slit width (62 nm), and about 5,500 times smaller than the space between the two slits (272 nm), the interference effect was unambiguous in the experiment. I advice you to google the results yourself (or read that April 2014 post of mine if you want a summary): the experiment was done at the University of Nebraska-Lincoln in 2012. 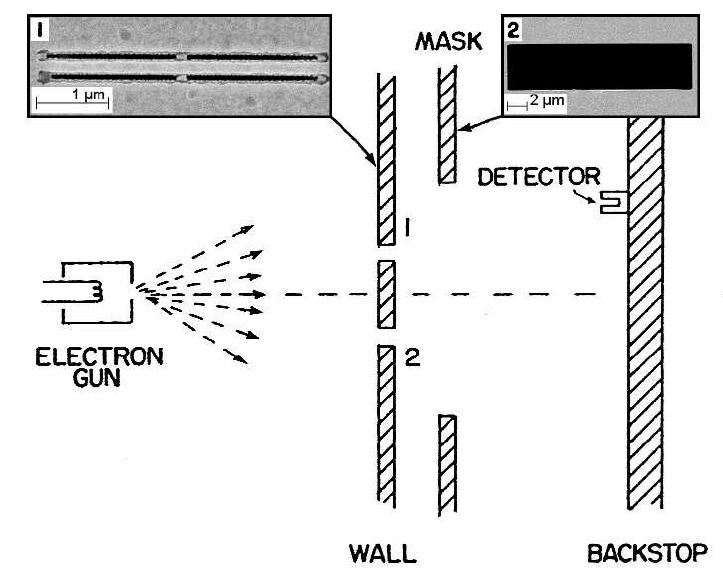 To put everything in perspective: 50 picometer is like the wavelength of X-rays, and you can google similar double-slit experiments for X-rays: they also loose their ‘particle behavior’ when we look at them at this tiny scale. In short, scale matters, and the boundary between ‘classical physics’ (electromagnetics) and quantum physics (wave mechanics) is not clear-cut. If anything, it depends on our perspective, i.e. what we can measure, and we seem to be shifting that boundary constantly. In what direction? Downwards obviously: we’re devising instruments that measure stuff at smaller and smaller scales, and what’s happening is that we can ‘see’ typical ‘particles’, including hard radiation such as gamma rays, as local wave trains. Indeed, the next step is clear-cut evidence for interference between gamma rays. Isn’t that an odd dichotomy? If we see that, on a smaller scale, particles start to look like waves, why would the reverse not be true? Why wouldn’t we analyze radio or radar waves, on a much larger scale, as a stream of very (I must say extremely) low-energy photons? I know the idea sounds ridiculous, because the energies involved would be ridiculously low indeed. Think about it. The energy of a photon is given by the Planck relation: E = hf = hc/λ. For visible light, with wavelengths ranging from 800 nm (red) to 400 nm (violet or indigo), the photon energies range between 1.5 and 3 eV. Now, the shortest wavelengths for radar waves are in the so-called millimeter band, i.e. they range from 1 mm to 1 cm. A wavelength of 1 mm corresponds to a photon energy of 0.00124 eV. That’s close to nothing, of course, and surely not the kind of energy levels that we can currently detect. But you get the idea: there is a grey area between classical physics and quantum mechanics, and it’s our equipment–notably the scale of our measurements–that determine where that grey area begins, and where it ends, and it seems to become larger and larger as the sensitivity of our equipment improves. What do I want to get at? Nothing much. Just some awareness of scale, as an introduction to the actual topic of this post, and that’s some thoughts on a rather primitive string theory of photons. What !? I think my calculations in the previous post, as primitive as they were, actually provide quite some food for thought. If we’d treat a photon in the sodium light band (i.e. the light emitted by sodium, from a sodium lamp for instance) just like any other electromagnetic pulse, we would find it’s a pulse of some 10 meter long. We also made sense of this incredibly long distance by noting that, if we’d look at it as a particle (which is what we do when analyzing it as a photon), it should have zero size, because it moves at the speed of light and, hence, the relativistic length contraction effect ensures we (or any observer in whatever reference frame really, because light always moves at the speed of light, regardless of the reference frame) will see it as a zero-size particle. Having said that, and knowing damn well that we have treat the photon as an elementary particle, I would think it’s very tempting to think of it as a vibrating string. Yes. Let me copy that graph again. The assumption I started with is a standard one in physics, and not something that you’d want to argue with: photons are emitted when an electron jumps from a higher to a lower energy level and, for all practical purposes, this emission can be analyzed as the emission of an electromagnetic pulse by an atomic oscillator. I’ll refer you to my previous post – as silly as it is – for details on these basics: the atomic oscillator has a Q, and so there’s damping involved and, hence, the assumption that the electromagnetic pulse resembles a transient should not sound ridiculous. Because the electric field as a function in space is the ‘reversed’ image of the oscillation in time, the suggested shape has nothing blasphemous. Just go along with it for a while. First, we need to remind ourselves that what’s vibrating here is nothing physical: it’s an oscillating electromagnetic field. That being said, in my previous post, I toyed with the idea that the oscillation could actually also represent the photon’s wave function, provided we use a unit for the electric field that ensures that the area under the squared curve adds up to one, so as to normalize the probability amplitudes. Hence, I suggested that the field strength over the length of this string could actually represent the probability amplitudes, provided we choose an appropriate unit to measure the electric field. But then I was joking, right? Well… No. Why not consider it? An electromagnetic oscillation packs energy, and the energy is proportional to the square of the amplitude of the oscillation. Now, the probability of detecting a particle is related to its energy, and such probability is calculated from taking the (absolute) square of probability amplitudes. Hence, mathematically, this makes perfect sense. It’s quite interesting to think through the consequences, and I hope I will (a) understand enough of physics and (b) find enough time for this—one day! One interesting thing is that the field strength (i.e. the magnitude of the electric field vector) is a real number. Hence, if we equate these magnitudes with probability amplitudes, we’d have real probability amplitudes, instead of complex-valued ones. That’s not a very fundamental issue. It probably indicates we should also take into account the fact that the E vector also oscillates in the other direction that’s normal to the direction of propagation, i.e. the y-coordinate (assuming that the z-axis is the direction of propagation). To put it differently, we should take the polarization of the light into account. The figure below–which I took from Wikipedia again (by far the most convenient place to shop for images and animations: what would I do without it?– shows how the electric field vector moves in the xy-plane indeed, as the wave travels along the z-axis. So… Well… I still have to figure it all out, but the idea surely makes sense. Another interesting thing to think about is how the collapse of the wave function would come about. If we think of a photon as a string, it must have some ‘hooks’ which could cause it to ‘stick’ or ‘collapse’ into a ‘lump’ as it hits a detector. What kind of hook? What force would come into play? You must be laughing aloud now. A new string theory–really? I know… I know… I haven’t reach sophomore level and I am already wildly speculating… Well… Yes. What I am talking about here has probably nothing to do with current string theories, although my proposed string would also replace the point-like photon by a one-dimensional ‘string’. However, ‘my’ string is, quite simply, an electromagnetic pulse (a transient actually, for reasons I explained in my previous post). Naive? Perhaps. However, I note that the earliest version of string theory is referred to as bosonic string theory, because it only incorporated bosons, which is what photons are.